Lovage is one of those plants once common and fashionable but today obscure (at best); but while many such deserve their modern obscurity, some just sort of got lost despite merit, and lovage appears to be an example. It is a large, hardy perennial plant (some report it growing up to nine feet tall, but even six feet is not unusual) of which all parts, from root to stem to leaf to seeds, are usefully edible. The commonest use is the leaves, which are an herb said to taste largely of celery (perhaps, say some, with a light overtone of anise), and many who grow it find it a simpler and in many ways better replacement for celery (as one put it, “you never need to buy celery or parsley again—other than for celery sticks with Chez Whiz”). While we would disagree quite vigorously with the parsley part, we are inclined to agree with the celery part. It is, though, very strongly flavored, and needs to be used with a correspondingly light hand. Lovage is reported winter-hardy to Zone 3, which is awfully cold, so it should grow almost anywhere, though there might be problems at the other extreme, really hot climates (though some say it grows all the way to Zone 9). Lovage will last for many years, and has a large and powerful root system, so it needs a large space reserved for it, and in a location where its growth will not critically shade anything planted behind it. In winter, the plant dies back to ground level, but every spring it pops right back up again. Its growth is rather interesting: the first year it’s up, it will likely grow to perhaps two feet; each year thereafter (for at least the first five years and maybe more) when it regrows it will regrow larger than ever, up to typically six feet, though it can range from as little as four feet on up to as much as nine feet high. Also, it is generally held to do well in even seriously shaded areas, some saying that as little as a couple of hours a day of direct sun will suffice for it; though that might be a bit extreme, it should surely do on an east or west exposure, so you don’t need to surrender prime, full-sun “real estate” to grow it (some even say it does better with partial shade). Indeed, one needs to take a certain amount of care lest lovage become invasive. It’s not difficult to control it, but it does take diligence in pruning and minding seed-pod development. 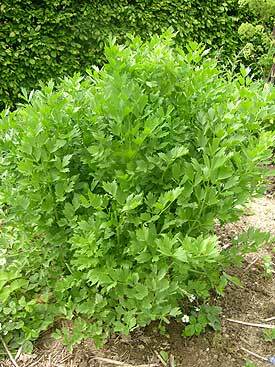 Sources disagree on whether lovage will do well in containers: several say yes, but others say no, owing to its large, vigorous root system. We’d guess, lacking personal experience yet, that considering its vigor it will grow in a sufficiently large container, but not to the size or vigor of an in-ground plant; but, since even if relatively “stunted” it can be pretty large, container growth would probably work. Lovage indeed is perhaps the most interesting of all the neglected old-fashioned herbs and is well worth experiment. If you grown it you will find uses for it. If there ever were named cultivars, there are not now, at least in the ordinary North American marketplace. Be sure you are using fresh seed: lovage seed does not store well. Start seed indoors in a peat pot; when timing the sowing, figure on it spending 6 weeks in pot. Be sure to start several seeds, because its germination is spotty even with good, fresh seed. Germination typically takes up to two or even three weeks, so be patient. You only start it once for ever, so be lavish in all ways. Figure to transplant after “the last expected frost date”, which might mean—as for us—perhaps mid-June (meaning you’d sow perhaps May 1st). Two thoughts: first, some gardeners have found lovage invasive—not ferociously, but in some environments it can, over the seasons, spread over some substantial area; second, it is a large plant generally considered quite attractive (though few or no flowers). Put those two together and one gets the idea of planting lovage (maybe even more than one) where one wants some decorative green masses. That will likely be a place you can easily reach and will be watering anyway. Keep lovage well-watered at all stages of growth, but especially right after transplanting; do not ever let it really dry out or it will get bitter. A light mulch, say grass clippings, helps hold moisture in the soil. A mild liquid fertilizer applied once or twice a season can’t hurt and might help, though lovage, treated well otherwise, is awfully hardy. As noted, in its first year it will grow to perhaps two feet; when it reaches a foot or so is when you can begin harvesting. For stem (as for use in soups or stews), always cut from the outside, being sure to leave the central stem intact. You can also harvest the seed, which can be used rather as you would celery seed; in early summer, a seed stalk—rather large—will form; let the seed ripen till the stalk starts to turn brown, then cut it off and dry the seeds. If you do not want to harvest seeds, cut the stalk as soon as it appears; that puts more of the plant’s energies into leaf growth. In general, it is well to trim lovage back around mid-year, because the its foliage becomes less flavorful as it matures: new (and better-tasting) growth will emerge quite soon. While lovage is quite cold-hardy, if you have fierce winters it is best to winter-mulch around it, say with straw, to protect the dormant root system. You can, and perhaps should, periodically dig up and divide your plant’s roots to “freshen” its growth. A few years after initial planting out, in the spring, dig it up and divide the roots (it typically has long, thick tap roots). If you like, you can process the removed roots by washing then cutting into small pieces that you dry (as on a screen) and store out of the light; such dried root can be used in soups and stews. Lovage, as noted, dies back for the winter, but both leaves and stem take well to freezing (but—as with many herbs—not to drying). It is prolific, so be sure to harvest and freeze an adequate supply of it for the cold months. It was last modified on Monday, 4 February 2019, at 03:48 EST.